Extremely hard (H=7), tough, dense, silica rock with conchoidal fracture. Color varies extremely from opaque black, to gray, white, yellow, brown, red. Chert is resistent to weathering and so tends to stand out of the ourcrop. At first it would be very easy to confuse this specimen with some micrites. This chert and micrite #2 look superficially almost identical. Two test separate them clearly, however. First, hardness; micrite is softer than a knife blade, while the blade just slips across this surface. Second, micrite reacts with acid, chert does not. Chert forms in many associations, from clastics to carbonates. Cherts typically form in places where clastic influx is low (i.e. 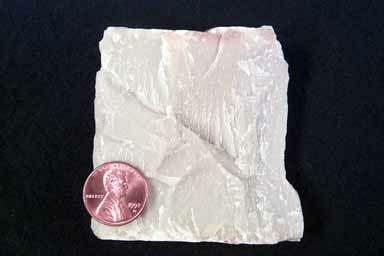 clastic starved), or in carbonate environments. Both of these generally require tectonic quiesence. The very clean nature of this specimen (indicated by its color) tells us it was probably formed in a very clastic-clean carbonate environment. Many kinds of chert form from recrystallization of siliceous skeletons (glass sponges, diatoms, radiolarians). Some chert may be produced chemically. Two broad types of chert form, nodular and bedded, with abundant variations in between. Bedded chert typically forms in clastic starved basins (i.e. those with little sediment influx), along the edge of continents (such as divergent continental margins) where strong upwelling occurs. Deep water upwellings bring nutrient rich waters to the surface resulting in algal blooms, population explosions of microscopic organisms, many of whom produce silicious skeletons which settle to the bottom and recrystallize to form form thick bedded chert. Nodular chert is more associated with shallow water environments, especially in carbonates. Here the silica chemcially replaces the carbonate, often times including fossils.